As there is serious discussions going on about our previous Automatic LED Emergency Light Circuit using LM 317, Mr.Seetharaman has come up with a modified version of the same which answers many of the doubts raised in our Comments section. 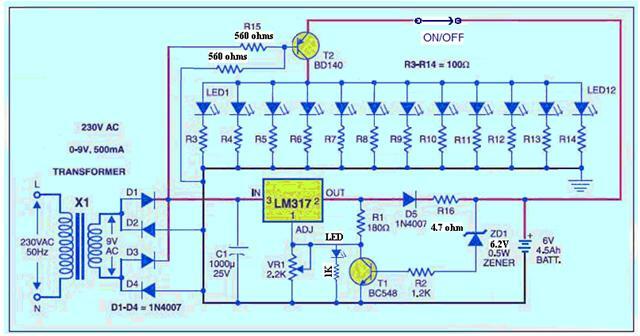 Here follows Seetharaman’s Description about the Modified Automatic LED Emergency Light using LM 317. Since there were lots of doubts from our readers on the LED emergency light, I haveÂ written a detailed letter to two of our readers. Of course few modifications are required, which I have indicated on the drawings and on calculations how I arrived at it.Â I thought of enclosing it to you so that it can be kept in some library of our site for any ones reference. For each circuit we can have a similar detailed theory, may not be with all calculation, just general operation theory of each part of the circuit. You may think of it. As a first feed back I am sending this.Â I have a feeling that most of the people would have made the mistake in base emitter ofÂ BD140, the lead out are against normal convention. To understand the above circuit in a better way, it can be divided into two parts. 10. The bias resistance will be (5.4 â€“ 0.77) /Â 6 = 770 ohms Hence a 680 ohms was preferred for bias resistance with drained battery also it will give enough brightness. 11. The very important information about BD140 is, as you view the pins, metal portion of the transistor facing down left is emitter centre collector and right is base. Most of the constructors make this mistake, relying on the convention that left base and right emitter. If you have made this mistake please correct it. Once this portion is checked for reliable operation we will proceed to charger portion. PCB’s for this project can be orders through PCBWay. We shall upload gerber files (made according to rules of PCBWay) shortly. 1. The battery requires a full terminal voltage of 6.9V at this point charger should cut off. 13. The drop across protective diode D5 is 0.7 volt. 17. The nearby standard value for operation is 5 ohms. 18. At the end point of battery 5.4 volt the maximum charging current can be of (8.9 â€“ 5.4) / 5 = 0.7 amps well within the higher charging limit of the battery. 19. With this circuit over night the battery will get charged fully. Hope with the above guide line you can make your light work successfully. Mr. Seetharaman has further modified this LED Emergency Light with an under voltage cut-off protection to protect battery from deep discharge. Once the battery terminal voltage falls below 5.7 volts the LEDs will be switched off. Take a look at the modified circuit shown below. The bias resistance will be (5.4 â€“ 0.77) /Â 6 = 770 ohms Hence a 680 ohms was preferred for bias resistance with drained battery also it will give enough brightness. The very important information about BD140 is, as you view the pins, metal portion of the transistor facing down left is emitter centre collector and right is base. Most of the constructors make this mistake, relying on the convention that left base and right emitter. If you have made this mistake please correct it. The battery requires a full terminal voltage of 6.9V at this point charger should cut off. The drop across protective diode D5 is 0.7 volt. The nearby standard value for operation is 5 ohms. At the end point of battery 5.4 volt the maximum charging current can be of (8.9 â€“ 5.4) / 5 = 0.7 amps well within the higher charging limit of the battery. With this circuit over night the battery will get charged fully. I have made the circuit as per the design. But the leds are not working automatically. It doesn’t switch off during charging. It glows even if there’s power and glows until the switch is off or the battery is low. Can you please advice me about this ? I have used the first circuit in this page. Can you have pcb diagram of this circuit?? plz sir sent me parts details & transistor pinout (like ECB) indicate as because i am fully new. so difficult to realize your diagram. Please sir help me. Plz Plz sir waiting for ur reply. good and very simple to construct your circuit. For the above circuit, can connect 3V motor pump for aquarium (Fish tank) with series of 4 diode to drop the 3V in the battery +ve side instead of LED load. If it is wrong, Please reply with good solution. The LEDs will NEVER TURN OFF !!!!!!! The 560R and 560R form a voltage divider that keep the LEDs on all the time !!!!! Another circuit that has not been tested !!!!! â€¢	The output voltage of the LM317 should be adjusted to be the voltage drop on the ZD1+R2+T1 chain become (6.9 or 7) Volts that means the cathode point of the ZD1 reference to ground and the battery terminal equal to the mentioned value, but in this case the zener diode will be permanently open and T1 is ON so how would we make the battery receive the charging current.